STEPHENVILLE – Katelyn Conlee‘s remarkable opening week of softball garnered the junior left-hander her first career Player of the Week award from the Lone Star Conference on Tuesday. 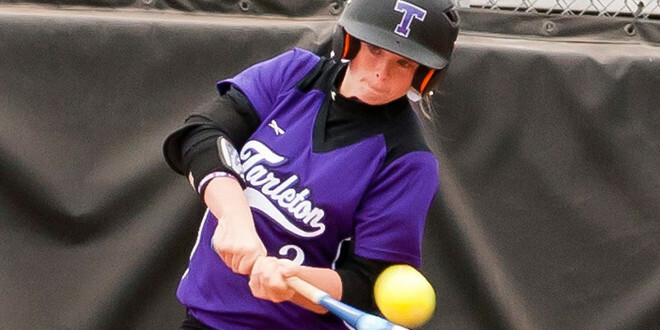 Conlee got off to one of the most incredible offensive starts in Tarleton State history last week, earning 10 hits in her first 10 at bats of the hits en route to a .692 batting average for the week. She has a hit in every game so far this season, including going 7-7 with 10 RBIs and three extra-base hits in the season-opening sweep of Southwestern Oklahoma last Monday. Among players with at least five at bats, Conlee is leading the Lone Star Conference in batting average after the opening week as well as leading the conference in hits (18), RBIs (14) and total bases (28). Her efforts at the dish led Tarleton to 62 runs scored over the first six games, which is the most by a team in the LSC, and a 6-1 record thus far for the best start to a season since 2007.